Are you curious to find out how you compare to your friends, colleagues and family-members on levels of intelligence and concentration? If so, you should definitely take The Moron Test: Section 1! This test report comes from Paulina Gegenheimer, a high school student and a real Android fan. Although Moron Test is located in the Games section of the Market, it’s a test and not a game. So what’s this app supposed to test? 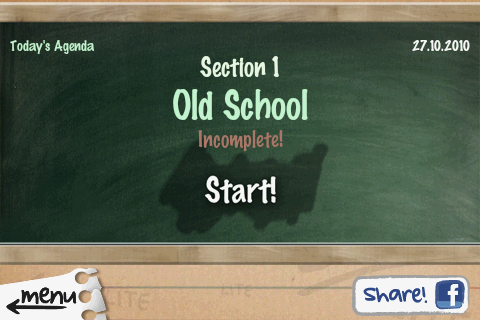 It starts off really simple: select the only available unlocked mode called Old School that includes sections 1 through 4. The test begins automatically as soon as you touch the Start! symbol and starts giving you different commands with a clock located in the bottom left corner. 1. 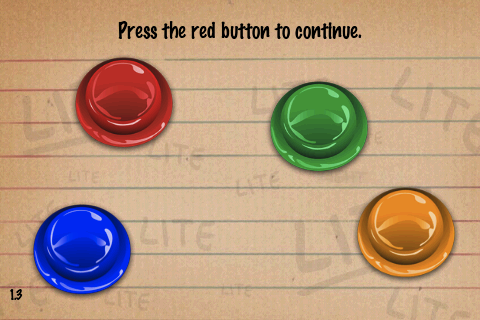 Press the red button to continue! Yeah, it’s really just that simple! 2. Where are you right now? 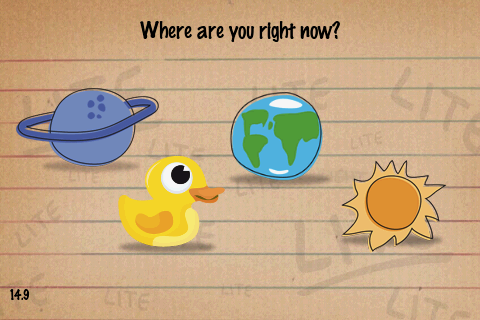 You can choose between a planet, a rubber duck, the sun and the Earth. Any first-grader will be able to answer this question in a second and so should you. Next question? 3. Crack the eggs from left to right. Again, not really a challenge. 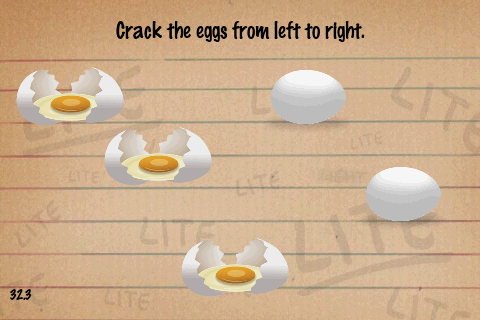 The player just has to crack the eggs in the right order. You are probably thinking to yourself “this test is way too easy; any dimwit could figure out this test”. And, you would be perfectly right in saying so because this test isn’t called a Moron Test for nothing. Don’t get too self-confident just yet. Moron Test does actually get harder as you move along. There are over 100 questions available and each one is different in terms of content and difficulty level. Some of them are trick questions that can get you if you lose a bit of your concentration. Once you’re done, you can look at your time and score in order to compare these with your friends. If you breezed through this section, you can try to move on to the next one to see who the real moron of the bunch is. The game is cute and a lot of fun, although you shouldn’t take the results to seriously. The Moron Test: Section 1 has a good clear layout. No tutorial is included, but it’s really unnecessary since the questions are all very self-explanatory. In the main menu you are greeted by a friendly little monkey followed by other animals advertising the full-version. There’s a small sheet of paper next to the monkey showing all the available tests. Old School is the only test option when you start the game. In the top left corner of the screen, you’ll see an icon to close the test and you can open the sound settings by pressing the symbol at the top right. That’s all there is to know about controls. The test screen itself includes a prompt, an explanation and a clock in the bottom left corner. After certain questions, you’ll see a small menu with a summary of your points and then you move on to the next one. You come back to this menu when you make a mistake. There is no game over, you just lose some precious times. As far as speed and reliability are concerned, I am not very impressed. 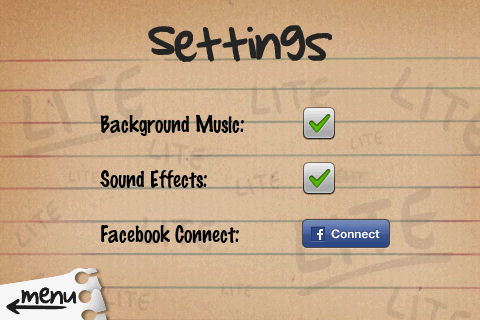 The Moron Test: Section 1 forced close on me a couple of times and it lagged whenever I switched the screen on/off. 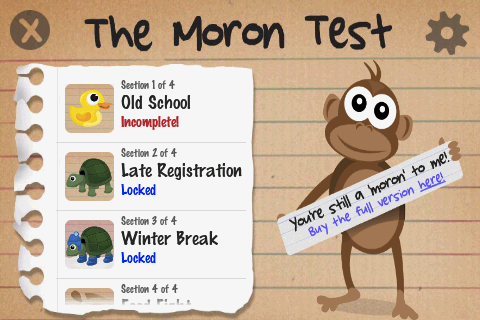 You can download The Moron Test: Section 1 for free from the Android Market. The full-version costs $0.99. A test of phones not a game of phones.